zarinahtakesapaycut: Will the PwC Malaysia partnership break up in the Year of the Rabbit? Will the PwC Malaysia partnership break up in the Year of the Rabbit? From the streets of Cairo to the corridors of Level 10, 1Sentral, this is Chin Kwai Fatt, the MD of PwC Malaysia's, Hosni Mubarak moment! When the Kanebo accounting fraud was revealed in 2005, "PricewaterhouseCoopers International moved swiftly. The same month, while it said that it will help Chuo Aoyama to correct standards and practices, PwC granted its affiliation to a new firm called Aarata. Many of the Chuo Ayoama accountants and partners moved to the new firm. "This new member firm will operate under a new management and governance structure, and will be of a sufficiently large scale to serve its clients," PwC had said at that time. Less than four months later, in September that year, Chuo Ayoama restarted operations with a new name: Misuzu. But, by then, the damage had been done and the two firms—Aarata and Misuzu—together had 30 per cent less clients than what Chuo Ayoama had before the scandal broke." By early 2007, Misuzu was shut down, after another scandal surfaced, "The suspension led to chaos among the firm's audit clients, which included Sony and Toyota. PwC's global bosses made it their priority to tend to the needs of Japanese multinational clients and foreign blue chips with subsidiaries in Japan. Mr DiPiazza said Aarata's limited size reflected the availability of staff who met PwC's performance standards. "We would have hoped the Japanese profession evolved to a higher level of quality over the years," he said. "It did not." He said cultural differences could not be used as an excuse for lower quality." There is real concern that the New York bosses of PwC might decide to pull out of Malaysia. The Senior Partners in Malaysia are very upset with the allegations that remain unanswered, and the chatter is that many of the firm's Senior Partners are now avoiding Chin Kwai Fatt like the plague. 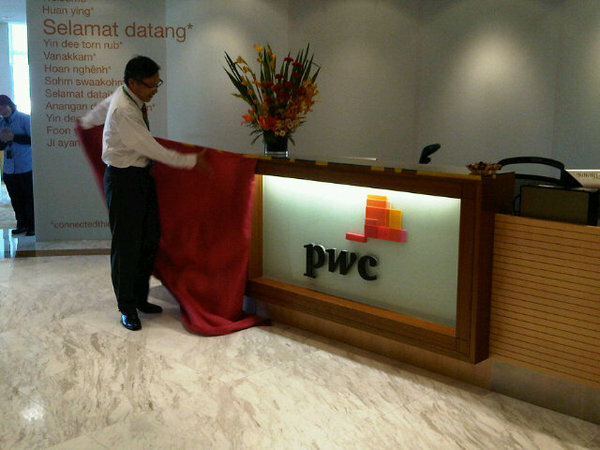 Chin Kwai Fatt unveiling the new logo of PwC, with less fanfare than one would expect. Chin Kwai Fatt does not want to answer the questions raised by the Partners, and they are understandably upset at this. Already there is word that at least six (6) of the Senior Partners in PwC Malaysia are planning to leave the firm in the months to come. Chin Kwai fatt was born in September of the Year of the Sheep, 1955, and some say that the Year of the Rabbit can prove to be a very challenging one for those born in 1955. Staff morale is falling, and none can blame the staff for feeling low when no one is prepared to come out 'guns blazing' to shoot down and answer the allegations of fraud and corrupt practices raised here. How many times has Chin asked the girls to give some meaningless answer or other when they answered his calls? Probably not what they thought they will be doing when they joined PwC in the first place. The uncomfortable silence that envelopes the atmosphere there can become too much for some to bear, and even if the bosses in New York decide to do nothing at all, the risk that PwC Malaysia might break up in the weeks and months to come is not something that is as improbable as it would have seemed just a few months ago. We have to ask Mr Boorman this question. Mr Boorman, will you allow your children to work for PwC Malaysia when they grow up, if the Global Leaders let things remain as they are now? Mr Boorman, what would you say to someone who wants to join PwC Malaysia today?